Designed for ultimate comfort and a timeless, classic look to your Apple Watch and your style. The soft silicone strap is specially designed to work with Apple Watch. Built from sturdy material, effortlessly complement your style with Apple Watch. 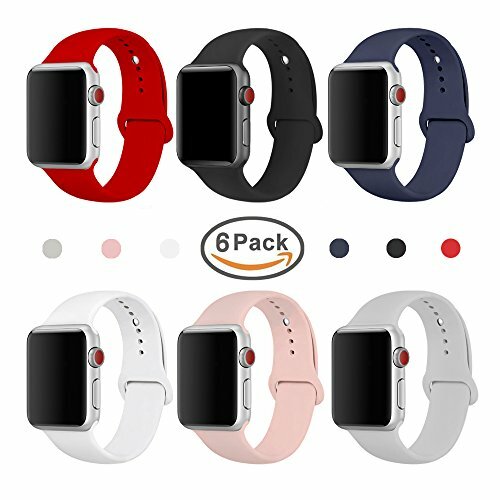 MUZZAI 6 PACK Soft Band for Apple Watch. Notice: package does not include any Apple Watch! Perfect Material - Sports Band for Apple Watch is made from flexible and durable elastomeric Silicone, which is Comfortable & Eco-friendly for human skin to wear. Muzzai Replacement Wristband for apple watch design ergonomic, easy to install. No need any tool installation. 6 different colors make your apple watch band more personalized to fit your mood and outfits in daily life. If you have any questions about this product by MUZZAI, contact us by completing and submitting the form below. If you are looking for a specif part number, please include it with your message.